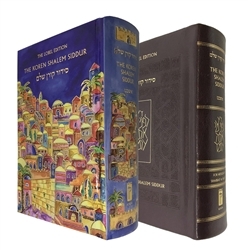 The Shalem Siddur is an expanded version of the popular Sacks Siddur. A full Siddur for weekday, Shabbat, holidays, and festivals, it features an introduction to Jewish prayer, translation and commentary by Rabbi Jonathan Sacks. This edition has additional features such as Torah readings for holidays, Haftarah for Yom HaAtzma’ut, new English translations of the Torah readings for the Shalosh Regalim (Sukkot, Pesah and Shavuot), 5 Megillot with new English translation, a section for bakashot (personal supplications). Leather edition has gilded pages and a cardboard slip case.